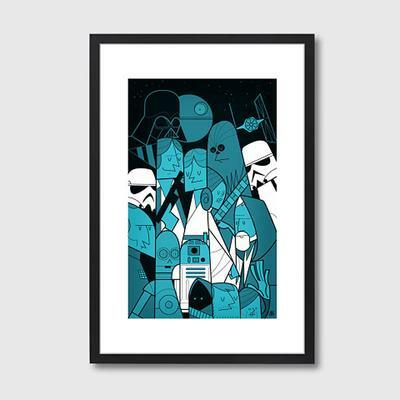 The perfect way to pay homage to the upcoming Star Wars film, this Star Wars Framed Print lets you display 'the force' right inside your living room! Created by Ale Giorgini, the artwork features the entire crew in caricature form. You have Chewy, Han, Luke, R2D2 and C3PO, Obi Wan, Darth Vader and a stormtrooper or two. You can even spot the Death Star in the background. It's definitely a fun piece to have on your wall! The print is placed in a wooden black frame under white matting and shatterproof Perspex glass. This ensures it's protected from dust and damage. Keep this for yourself or give this as a gift, it's bound to make someone you know happy. Grab this and may the force be with you!